Babylon Reinvented: How to Approach ICL - Stowarzyszenie Młodzieżowych Inicjatyw Twórczych "CREATOR"
We are happy to announce that SMIT "CREATOR" members were participating in the Youth Exchange project called Babylon Reinvented: How to Approach ICL co-ordinated by Kharkiv Women Civil Organization Center “Perspective”. 20 youngsters gathered in Ukraine to evaluate their cultural background, look at the historical development and evolution of European heritage and identify themselves in the vivid society. 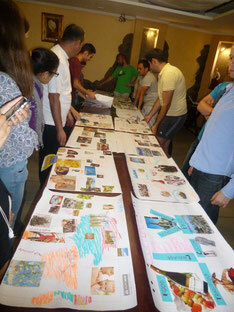 The aim of the training course was to raise the awareness of young people about cultural diversity of the modern world. During the training trainers created various educational situations and applied non-formal learning methods which made 7 days are interesting and participants could learn something new about origins of racism, intolerance, xenophobia. Besides the group discussion about European citizenship and presentation of the data of minorities in our countries the participants could introduce each other their national dances, songs, food and even fairytales. Representatives of each country tried to be creative, some of them could be awarded in the nomination “Best actress/actor”. The trainers prepared a good schedule when the participants have time to learn and the possibility to discover the city of Lviv and its people and sightseeing. During the last week of June four members of the SMIT “CREATOR” were participating in the Training Course “Babylon Reinvented: How to Approach ICL” which was held in Lviv. The TC was organized by Kharkiv Women Civil Organization Center “Perspective”. More than 20 participants from 9 countries came together to discuss issues connected with cultural diversity, cultural understanding, European citizenship, so ICL – Intercultural Learning. We focused on subjects concerning cultural diversity, different minorities, exclusion and inclusion in societies, or discrimination. During the sessions prepared by Angelica we had amazing opportunity to get to know each other, our culture, differences between our approaches to development of cultures. Used methods - group working, simulations, role playing taught us how to find a compromise even despite some language circumstances we had met. After the TC, hope we will understand each other better what will benefit in future to build conscious and unified societies without problem of discrimination.